Wisconsin Congressman Paul Ryan (R-WI) says Democrats didn&apos;t win the 2006 elections…Republicans lost it. The First District Republican says the GOP lost the Congressional majority in the last election because they didn&apos;t “walk the talk.” He says the party showed its hypocrisy when members didn&apos;t live up to the principles they try to implement in state government. Ryan says those flaws need to be fixed before Republicans can take control back. Until that happens, he says the GOP shouldn&apos;t be in charge because it will just be a repeat of the situation prior to last November. Ryan says the party must get its act together quickly, because the US faces major obstacles in the future, such as Islamic Fascism, Globalization, and the money the US is spending on entitlement programs. 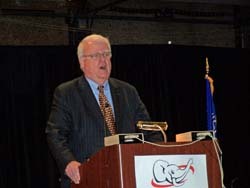 Congressman Jim Sensenbrenner (R-WI) agreed with much of what Ryan told delegates during the State Republican Convention this weekend in Lake Geneva. He say the party lost it&apos;s “brand identity” and didn&apos;t give Republican voters a reason to vote for them.